The original Test Drive Unlimited, believe it or not, remains one of my favourite games to have been made in the current generation. In an era where the likes of BioShock, Uncharted and Mass Effect have also been created -- not to mention smaller pleasures such as Braid, Limbo and Geometry Wars -- that’s no mean feat. 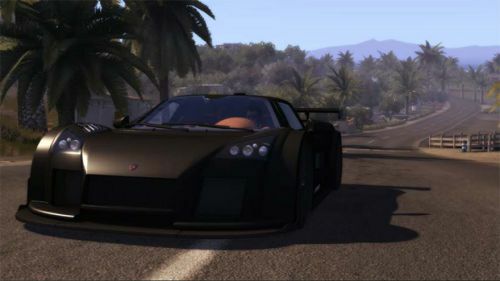 To put it simply, I loved Test Drive Unlimited because it enabled me to just drive: to go wherever I wanted, at whatever pace I wanted, and in whichever car I happened to choose. Sure, I could just as easily go for a cruise in real life, exploring the real world as opposed to the virtual, but then I’d have to follow the rules that the real world has in place to ensure things like safety, well-being and fairness -- not quite the relaxing experience I’m after. Test Drive Unlimited 2, then, is high on my anticipation list, for the exact same reason I enjoyed the first game, as well as many more. First of all, new additions such as a day/night cycle and weather should enhance the drive, a trip home from the dealership in my new car of choice as the sun begins to set presumably quite relaxing, not to mention beautiful. A gentle coastal cruise as a storm closes in, however, could be at once stunning and a little bit unsettling, the paint job of my incredibly expensive set of wheels about to be drenched whilst my ability to stay on the bitumen now uncertain under the increasingly slippery conditions. Perhaps venturing off the beaten path wouldn’t be so bad after all, the new off-roading sections of the game enhancing the variety of places to go whilst simultaneously adding yet another thing to do within the game’s gigantic islands. And perhaps it’s that plural that excites me most: it took almost five (!) hours to drive around the outskirts of Oahu with a friend in the first game; the fact that it returns and sits alongside new addition Ibiza in the second is both daunting and delightful. New places to go, new areas to visit and new locations to explore, combined with the familiarity of an island I came to call home during my time playing Test Drive Unlimited, certainly makes for an enticing prospect. The game’s new rewards system also seems interesting, the different modes of play invented in the emergent spontaneity of online play in the original now a prominent selection in its sequel. Handing out the rewards regularly as players explore the islands or demonstrate their talent behind the wheel in the ubiquitous races should make for a nice mix of discovery and victory, while getting together with friends -- or strangers -- for a casual cruise or a competitive chase should give the thrill and excitement of other racing games in an environment that, hopefully, is a joy to inhabit. Most of all, however, I’m just looking forward to grabbing the keys off the table, entering the garage and vehicle of my choosing, and heading out for a nice and relaxing drive. If I happen to discover something cool or win a few races along the way, perhaps even meet some new people, even better. You are right just the fact that you can do what you want to do is amazing. Want to go from race to race or just have a relaxing drive the choices you have are great. In a lot of racing games you never have the time to see the beautiful details but this game does. My favorite feature in project gotham was just walking around the show room looking at all the cars you acquired and just taking them for a joy ride. Gaming in Public -- You'd enjoy Test Drive Unlimited 2 then, if you haven't played it already. I got it on Thursday and have played it for two nights and there's some things reminiscent of the part from PGR you mention, particularly in your garages and in the various car dealerships. It even controls similar, so you'd like it. As for the game, I haven't experienced that 'freedom' you're referring to and that I know definitely exists yet, mostly because I've been trying to get some early races and missions out of the way. Why? To get established with a couple of houses and cars to choose from, and also to get away from having to hear the horrendous voice acting that makes up the game's silly cutscenes. Once I'm comfortable I'm going to ignore the objectives and go exploring and just do what I want. Having said that, I'm curious to know whether exploring the second island, Oahu which was from the first game, will be a waste of time since I probably already know it (photographic memory) pretty well. Oh and on an aside, my favourite feature from PGR, aside from the obvious enjoyable racing, is the inclusion of Geometry Wars in its various incarnations. Goddamn I love that game. I guess this is a must have then! My pockets are empty for now so i'll wait till I get payed. Yeah Bizarre Creations needs to get picked up again so they can do DLC titles again. It is truly sad that they won't be making racing games or any game in fact since Activision let them go.